Lonely is a feeling but facing life’s struggles and battles alone is a choice. Have you ever had a bad day? Ever had a bad week, a bad month or a bad year? Have you ever been discouraged, felt hopeless, unmotivated or depressed for days? Have you ever faced a situation in your family, work or relationships that was overwhelming or falling apart? Did you ever make someone aware that you were having a difficult time or could use some help or support? Did you face it alone and let people know long after the fact or “just deal with it” on your own? I have been blessed with loving family and supportive relationships around me, but I have realized in the last couple years (Process: Tough-Guy Detox) I have been guilty of “fighting alone” instead of reaching out for help or support in those times. Maybe you can relate. . . ..
We all have reasons we have fought alone at one time or another, but I believe they primarily fall into one of three reasons. Sometimes people expect rejection like they have experienced in their past. For others, the question is, “Will they still respect me if they see my struggles and weaknesses?” Good question. The short, scary answer is maybe. Some people will not understand, accept or respect you for asking for help. The truth is those types of people are unaware of or in denial about their own humanity and need for help to be a safe place for others. You and your future are too valuable to let fear keep you from successfully overcoming the obstacles and challenges you face. There are people, groups and environments if you will persist to find them. This is a false belief that many embrace, although most of the time it is much more subtle. Sometimes it is because people would rather look well to others instead of actually be well on the inside. Usually it comes off as something more like, “It would be a good idea to have support and fight my battles with help but I can probably handle it.” Often people know it would be a good idea to not fight alone but they don’t have a high enough value for it to make priority and put it into action. If “I can handle things without help” were really true, these people should all be offering their service, strength, great wisdom and support to others. However, I have rarely seen someone that doesn’t see their need to fight together offer their “strength” to others because “I’m fine on my own” usually means I don’t see my own need and therefore I don’t have a value to help others either. This amounts to “I love what I am doing more than connection and wholeness so ‘alone’ is my way of keeping it in the dark”. Sometimes this is a blatant choice to take advantage of others. Sometimes it is coping mechanisms (addictions, lying, money problems, integrity issues, etc.) that have become a problem someone may or may not want to continue long term but are choosing for now. We have all experienced one or more of these at one time or another. Something I have learned is that fighting alone is basically waiting to fail. You, your family and your future are too valuable to continue fighting alone, choose to reach out and begin to overcome things that have kept you stuck and fighting alone. BREAK IT DOWN: Process it some more with some coffee or friends! In 1 John 1:7 what are the 2 things that happen when we bring our struggles into the light with God and others? Below is the Greek word and definition for “fellowship”. Which of those things do you have in your life? Who with? Which ones could or would like more of and why? 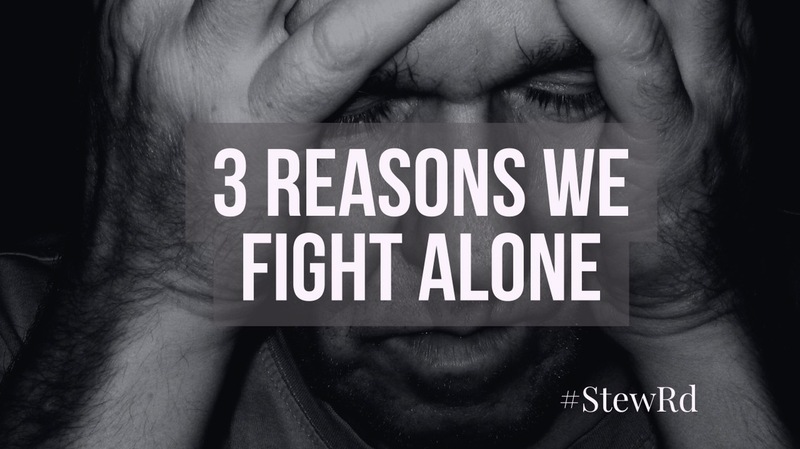 Which of the 3 reasons for fighting alone would you most identify with? Are there any battles or struggles you have that you are currently fighting alone in? (work issues, family issues, relationship problems, emotional issues) What are the reasons you do not reach out for support and help in those areas? What are some practical ways you could move beyond fighting alone? *** (if in a group, get responses from others before going over options below). Phone a friend, join a support group, talk to a counselor, pastor or a friend..